A group is installing alternative blue plaques in Hull to celebrate the city's unusual achievements and interesting characters. Calvin Innes, of Drunk Animal Creative Studio, said the idea was to feature "the good, bad, and quirky". 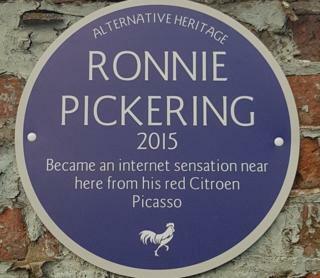 The latest addition to the collection is a plaque for Ronnie Pickering, whose outburst against a motorcycle rider went viral in 2015. The plaques also mark local cuisine, including a spicy condiment for chips. Mr Innes said there were now 17 plaques dotted around the city, with more planned over the coming weeks. Who deserves a blue plaque? Mr Pickering hit the headlines in 2015 when he was filmed asking a motorcycle rider "do you know who I am?" and challenging him to a "bare-knuckle fight" after being overtaken. He later apologised for his outburst. Mr Innes said: "Whether people like it or not, it is a part of Hull's make-up. "We are celebrating the good, bad, weird and quirky." Mr Innes said the plaques, "championing the living legends of Hull", had generally been well received, with the most popular public suggestion by far being Mr Pickering. The alternative plaques, which have all been installed under cover of darkness, and with permission from landowners, also honour Jean Bishop, who raised over £100,000 for Age UK while dressed as a bee, and Graham Boanus, who waded across the waters of the Humber for charity in 2005. Hull-born mathematician John Venn - who came up with a method to illustrate data in groupings - is celebrated, as is his beard. One wag on Twitter wrote: "I've never met John Venn, we don't mix in the same circles." There is also a tongue-in-cheek plaque marking the spot where in 1984 Lee gave Sandra a "croggy" - a ride on the handlebars of his bicycle. It is a nod to the playground talk of the 80s, Mr Innes said. Another hails Rod and Brenda Wilson who introduced "chip spice" to the city - a spiced salt condiment that is a ubiquitous offering in local chip shops. Graffiti painted on a shed at Alexandra Dock in the 1960s, known as Dead Bod, is also honoured. The artwork, painted by two trawlermen, welcomed fishermen on their return to the waters of the Humber.